When William the Conqueror arrived arrived in England, he embarked on a massive programme of castle building, which was carried on by his barons and subsequent kings of England for several hundred years. Castles were built to defend and protect, dominate and rule. They continue to captivate us today, whether well-preserved or in ruines, and remind us of the struggles fought on all sides for the right to govern England. 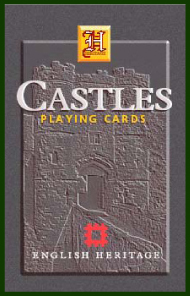 This pack of playing cards shows full-colour pictures of 54 different English castles, and is sure to delight all those who have an interest in England's history.